Clear and sunny - AND cool and breezy. Everyone survived the rolling hills, occasional soft spots, and periodic eroded gullies -- and there weren't too many missteps on the 3.4 mile course in the arroyo! Traditional breakfast potluck afterwards at the home of hosts Dennis & Glenda Muirhead. LOADS of food and plenty of coffee -- thank you to everyone who came, brought yummy stuff, and enjoyed the opportunity to visit with fellow runners and walkers. Handicaps Coordinator Shannon Zanelli handed out gift cards to our winners, and Fred Bonnell won a cool running cap in a random drawing. Join ARR for our December Handicap - December 15 - hosted by Shannon Zanelli. It will be a 2-person relay at Academy Hills Park (near Eubank and Juan Tabo NE). 26 Melani Buchanan Farmer Handicap Winner! 25 Kathy Goevelinger Handicap Winner! This course will take you through scenic Bear Canyon Arroyo west of Tramway Boulevard. It's mostly dirt and gravel, with some asphalt and concrete. There are some soft areas and some eroded areas, and here and there some spiny cacti, so caution is advised -- hey... it's a trail run. At the westernmost point of the course, you will scramble up a steep slope to the top of John B. Robert Dam (this will be familiar to you Breaking Bad fans, especially if you look over the edge to those weird concrete "teeth" of the spillway below). 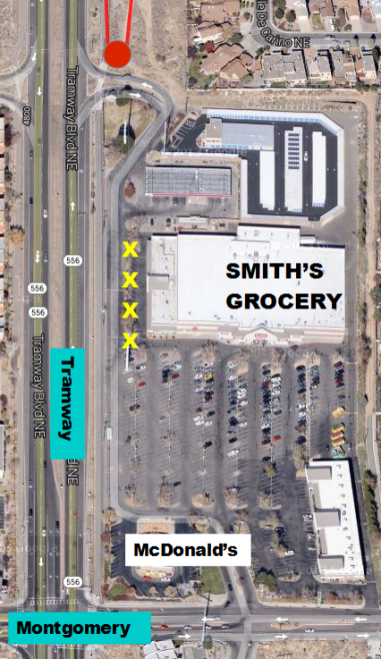 Meet at the shopping Center at the NE corner of Montgomery and Tramway NE. Click on the map at left to enlarge and view recommended parking area (yellow Xs) -- the course will start and end where the red dot is, at top. Enjoy a potluck breakfast afterwards at the home of hosts Dennis & Glenda Muirhead. Bring something along to share if you would like. There will definitely be coffee!